Adastral Park is located just outside Martlesham Heath, Suffolk, set in 100 acres of beautiful scenery. Whether you are visiting the park for a meeting or looking to join our tech cluster, our office accommodation comes fully serviced with high-speed broadband and meeting rooms. Plus there's first-rate on-site facilities and plenty of car parking. Adastral Park is located near Ipswich, Suffolk on the east coast of England, approximately 90 miles from London and 65 miles from Cambridge. If using a sat nav, enter the postcode IP5 3RE and follow the signs for reception. From the Midlands and the North take A14 east toward Ipswich. From London and the South turn off the M25 at J28 onto the A12 to Ipswich. Follow A14 East (signposted to Felixstowe), around Ipswich and over the Orwell bridge. Join A12 North (J58, signposted to Lowestoft) for approximately two miles. Adastral Park can be found by turning right at the second roundabout. When leaving Adastral Park, take a look at our site exit webcam to see live traffic conditions. If you travel regularly to Adastral Park or other BT sites, you may be interested in joining the BT Liftshare community. Find out more about electric vehicle charging on the amenities page. A regular train service runs from London Liverpool Street to Ipswich station, taking approximately one hour. From the Midlands and the North, there are connecting trains to Ipswich from Peterborough (via Ely or Cambridge). A regular service to Ipswich departs from Norwich once every half hour at peak travel times. Adastral Park is served by a number of regular bus services from Ipswich (including from Ipswich railway station). To find out details of these along with information on fares for both residents and visitors, please visit First Group's Adastral Park travel page. Taxi fares from Ipswich railway station cost around £15 each way. Adastral Park is a strong supporter of cycling to work. It provides health and financial benefits to the individual as well as the wider benefits of reduced pollution and congestion on local roads. Queueing to get off site by car during peak periods can take longer than cycling to Ipswich town centre, and Kesgrave is only 10 minutes away on quiet cycle paths. 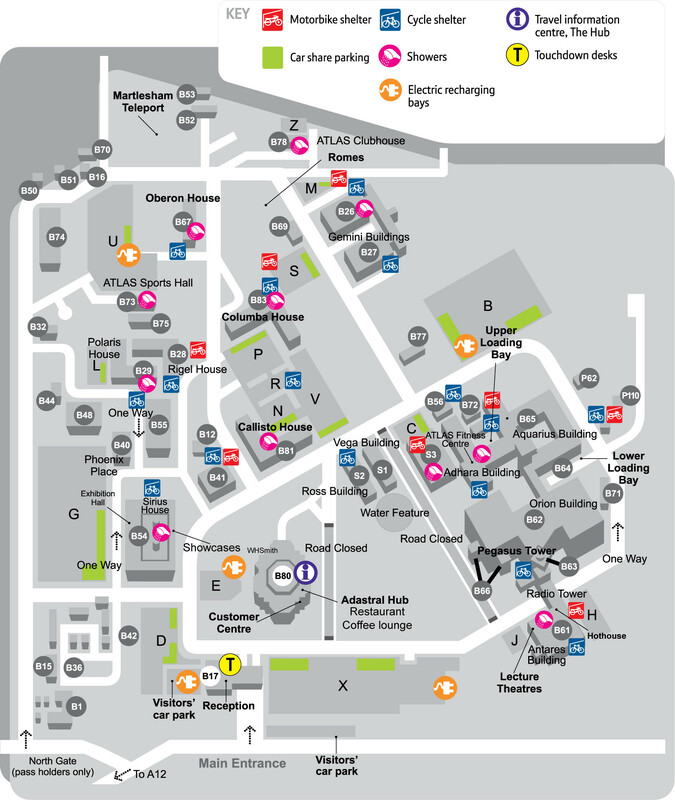 Cycle shelters are provided across Adastral Park, as well as lockers, showers and changing rooms (see park map). The Adastral Park Bicycle User Group works closely with site management to encourage, and improve facilities for, cycle commuters. Check out the CycleStreets journey planner for cycle-friendly routes to Adastral Park. BT employees can take advantage of the Cycle to Work scheme to buy a bike tax-efficiently. See Your Rewards on the BT Intranet. The nearest major airport to Adastral Park is Stansted Airport, which is located just over an hour's drive from the park, making it easily accessible from areas around the UK and the continent. Air Direct can be used to make arrangements for travelling between Adastral Park and Stansted Airport, using our shuttle bus to get to and from the station. For those arriving from Europe, it may be more preferable to arrive into London City Airport. It takes about 20 minutes to get from London City Airport to Stratford train station via Poplar on the Docklands Light Railway (DLR). Alternatively, you can take the DLR to Bank and change to the Central Line for Liverpool Street. Please see https://tfl.gov.uk/ for more information about public transport services in London.